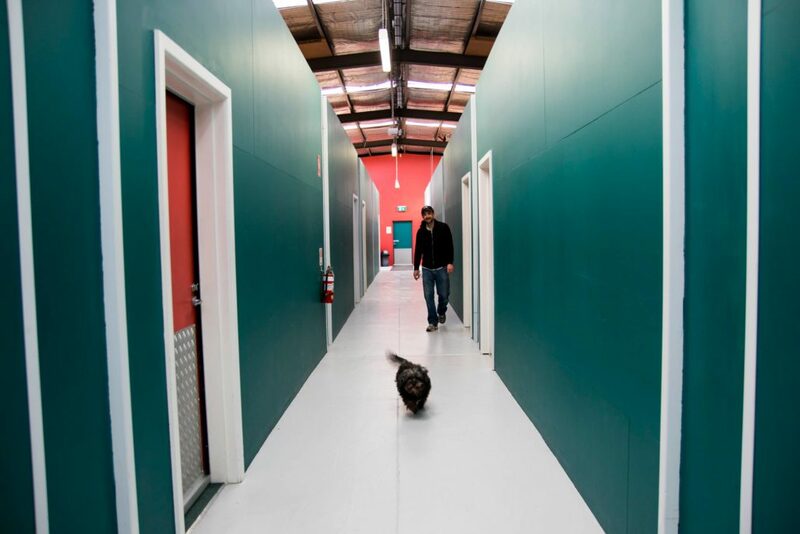 Hydra Rehearsal Studios consists of ten professionally designed, built and well-maintained music rehearsal rooms located in Burwood, Victoria, Australia. Each room is fitted with new (2013) PA’s: 2 x HK Audio Linear-5 1000 watt (RMS) active 15” speakers, 1 x Mackie ProFX12 desk and 1 x Yamaha MSR 400 watt active foldback speaker. Each room comes with three Sennheiser microphones and leads and three K&M brand microphone boom stands. Each of the ten rooms are identical and are 30m2 (5m x 6m) in size. They are medium sized rehearsal rooms and are perfect for 3, 4, 5, 6-piece bands; but larger groups have also found them comfortable. The rehearsal rooms have been designed by a registered and qualified acoustic engineer and possess immaculate soundproofing properties; you can barely hear the other bands rehearsing once you are inside your room. The owner of Hydra is a highly experienced musician, Peter, who is a Victorian College Of The Arts music graduate. Peter was an instrumental and classroom music teacher for 14 years and plays the tuba, guitar, piano and sings. Peter has played in 10 bands over his lifetime and was a founding member of the highly successful, ‘Martin Martini & The Bone Palace Orchestra’; a group which played gigs with Paul Kelly, Tripod and regularly had high-profile guests performing on stage with them such as Tim Minchin, Harry Angus and Eddie Perfect. The group enjoyed strong support from Triple J and performed at The Sydney Opera House Studio, Soho Theatre (London), multiple seasons at The Spiegeltent, and performed at The Adelaide Cabaret Festival, Brisbane Powerhouse and Woodford Festival, to name just a few highlights. Peter played guitar with SSPecker, an 8-piece live hip-hop group that was also quite successful, playing festivals and the major Melbourne venues for some 5 years. Peter is an experienced composer whose theatre works have been presented by The National Gallery of Victoria at Federation Square, The Victorian Arts Centre at The Fairfax Theatre and he most recently developed a new work at The Malthouse Theatre. During the late 90’s/early 2000’s, Peter was very active as a conductor and music director of musicals and operas (full cast and orchestra productions) at ‘The Whitehorse Centre’ and ‘Banyule Theatre’. He also conducted and music directed professional and semi-professional productions at Chapel Off Chapel, Federation Square and The Arts Centre, including the Australian premiere of Sondheim’s, ‘Saturday Night’. Peter managed local Melbourne trio, ‘Moroccan Kings’ from 2010-13 and during that time, got them their first bits of radio play, live-to-air radio performances/interviews, strong print media coverage and street promotion, their first festival performances and also their first Victorian and interstate touring experiences. Peter secured good support slots for Moroccan Kings with more established acts such as Sydonia, Twelve Foot Ninja and King Of The North, to name just a few.